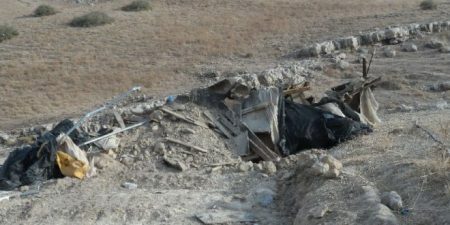 Israeli forces, on Thursday morning, have destroyed a road that leads to a Bedouin community site named Khirbet Hadidiya, in the northern Jordan Valley. An army bulldozer, accompanied with four military jeeps, broke into the area and destroyed, for the second time, the 2-kilometer-long road leading to the community where 120 citizens are living. PNN further reports that, according to the Director of Ka’abneh School, Mahmoud Jurmy, large forces of the Israeli army raided the area, close to Jericho city, demolishing a home made out of tin, for the third time in two months, located 30 meters away from the school.